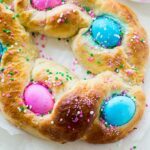 Easter Egg Bread is light and buttery with dyed eggs baked right in. 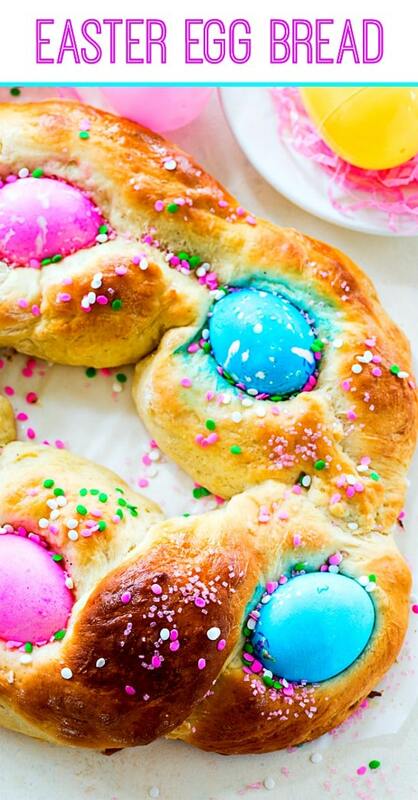 Top with some sprinkles and a sweet glaze for a wonderful Easter bread. The easy to make dough is a little bit sweet and flavored with just a hint of nutmeg and orange zest. The dough is a breeze to work with. You”ll mix it in a stand mixer and then knead it by hand. Such great therapy! The bread is perfect on it’\s own and served slathered with butter, but it’s even better with a glaze. This recipe calls for a glaze that’s sweetened with cane syrup. Cane syrup can be a little difficult to find, but you can order it online and it has many uses. It’s great for making pecan pie, an Old-Fashioned, and Mint Juleps. Plus you can drizzle it on your pancakes. The eggs should be dyed, but not cooked. They will cook in the oven. The dyed eggs will bleed a little on the surrounding dough. To minimize this, be sure to dye your eggs a day in advance so they have time to dry. Store them in the refrigerator. Be sure your milk is not too hot when you combine it with the yeast or it will kill the yeast. In the bowl of a stand mixer, combine milk and yeast. Stir together by hand and let sit 10 minutes. Using the paddle attachment, with mixer on medium speed, add sugar, salt, nutmeg, orange zest and eggs. With mixer on low speed, gradually add 2 3/4 cups flour. Add butter and vanilla and beat until combined. Transfer dough to a lightly floured surface. Knead for 5 minutes, adding up to an extra 1/2 cup flour if needed. Place dough in a large greased bowl, turning to coat the dough. Cover and let rise in a warm place for 1 hour. Dough should double in size. Punch dough down. Divide into 2 pieces. Shape each piece into a rope about 24 inches long. Place ropes on a parchment paper lined baking sheet. Loosely twist them together, pinching the ends together to seal them. 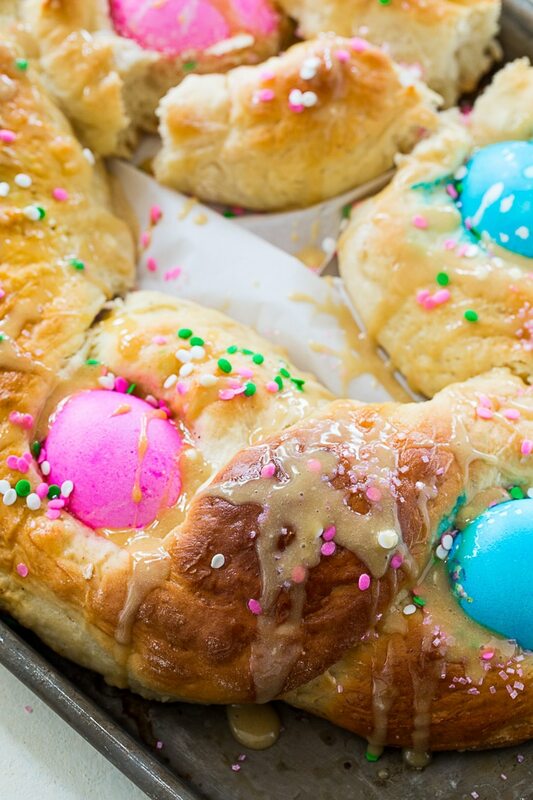 Separate the dough in 5 places and nest an egg in each hole. Cover and let rise for 1 hour. Mix together egg and 1 teaspoon milk and brush the dough with it. Bake at 350 degrees for 30 minutes. Cover lightly with foil after 15 minutes to prevent excess browning. Let cool. Whisk together glaze ingredients and drizzle over bread. If you don't have cane syrup, you can use the maple syrup or double the amount of milk. This entry was posted in Breads and Muffins, Easter and tagged bread, Easter. Bookmark the permalink. 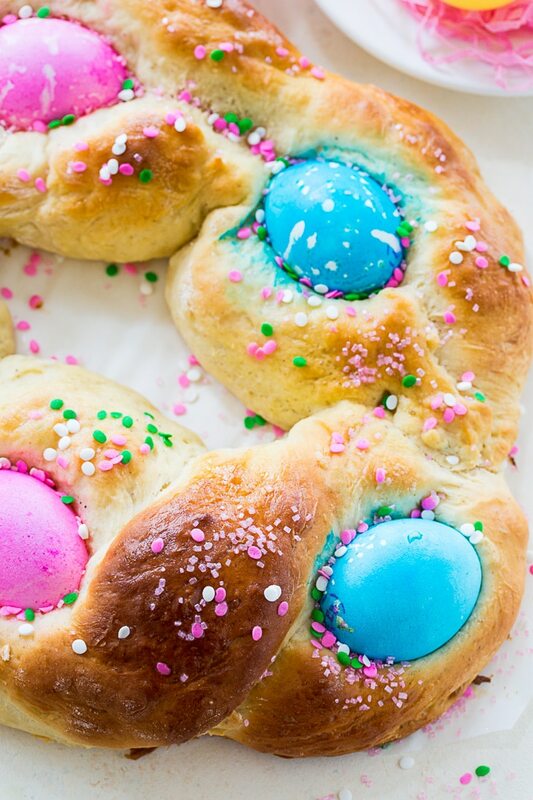 These Easter Egg Bread looks delicious and tempting. Kids and kids at heart will surely love and enjoy this bread.